What is an establishment of religion? it must have tests for the submissive and penalties for the non-conformist. By that definition, Christianity is clearly a religion (regardless of what Mr. O’Reilly says), and a Christmas tree or Crèche is not. Where do Atheism and Evolution fit in? Atheists and Evolutionists definitely have a creed, complete with revered books that define and expound those creeds.4 And with people like Richard Dawkins (for evolution) and Sam Harris (for Atheism), acting as a high priests, they both have ministers of sorts. But these clearly are not functioning in the true capacity of a religious official, nor are they within the institutional structure that Barton lays out. So they don’t quite fit the definition. Does that mean that atheism and evolution are not religions? No, not so quick. Note usage number 4: “a cause, principle, or system of beliefs held to with ardor and faith”. Is it possible to hold a belief with “ardor” and “faith” and have no one notice it? In a word, no. Yet this expression accurately describes particularly the new Atheists – who are marked by not only ardor and faith, but also arrogance, zeal and an inability to recognize their faulty reasoning. It also applies to evolutionists as well as traditional atheists (those less arrogant, less certain, and less militant). Thus in terms of everyday expression of a religion – Atheism, Christianity and the practical expression of Evolution all qualify as religions. They’re not all the true religion, but they all qualify as religions nonetheless. 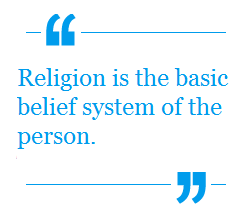 Notice his confirmation of religion as “the basic belief system of the person”. In passing, note also that that he, an evolutionist, is well acquainted with atheism and atheists. This is because evolution is the fruit of atheism8, so the two go hand and hand. Those who are committed to either are as “ardent” in their faith as any other committed religious believer. That is clearly seen with the emotionalism that is expressed by deeply committed religious people. If you have any doubts that atheists and evolutionists adhere to a religion, are connected to it emotionally, and believe it with ardor and faith, all you need do to test that, is speak against it. Claim that atheism and evolution are false ideologies, false worldviews that are utterly untrue -then stand back and watch. Those without faith and ardor would be indifferent to such statements. For example, nobody really cares if you claim that the Easter bunny is not real and doesn’t exist. Everyone – atheists, evolutionist and theist alike – all know that already. No one cares. The bunny is an acknowledged fiction that no one holds as a religion. (And this Christian is happy when people separate the fiction of the Easter bunny from the reality of the resurrection.) It’s only when you make claims that people hold in their hearts as true and genuine do you get strong reactions – as you get when you speak against evolution, or claim there is a God to atheists. … when you see these things from atheists and evolutionists – you know you’ve spoken against one of their beliefs which they hold close to their hearts – as one holds a religion. long, loud, prolonged and insistent proclamations and protestations that what they believe is not religion, we know the opposite is clearly the case. Cue the bard: methinks the lady doth protest too much. We’ve spent much time demonstrating that atheists and evolutions follow a religion. But the religion they follow is not the true one. Before leaving this topic, let me spend a moment to define what true religion is. Hear, O Israel: The LORD our God,the LORD is one. What is religion? Religion is the manifestation of your beliefs which are held with ardor and faith. Thus in a sense, anything that consumes your life can be regarded as a religion. 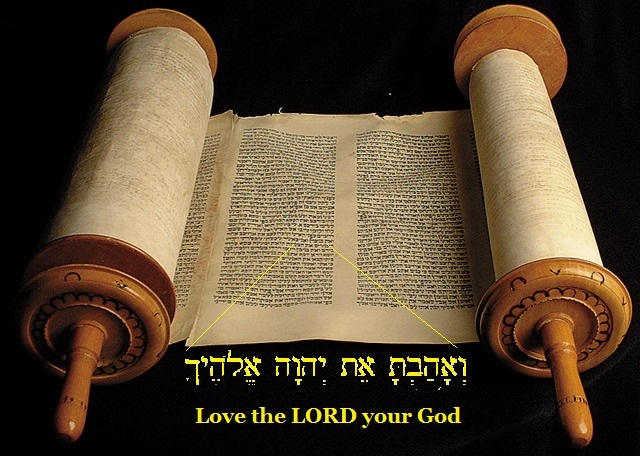 “‘Hear, O Israel, the Lord our God, the Lord is one. 5.Evolution as Universal Common Descent – the idea all organisms descended from a common ancestor. 6.Evolution as the “Blind Watchmaker” The idea that all organisms have descended from common ancestors solely through an unguided, unintelligent, purposeless, material processes such as natural selection acting on random variations or mutations. Evolution is assumed (and promoted); conclusions are drawn in according with this assumption. 12 Messianic synagogues are synagogues of Jewish and gentile believers who accept Jesus (Yeshua as they call him) as the Messiah. 13 Shema, Hebrew for Hear! ; Veahavata, Hebrew for “You shall love”; these two words are the first words of Deuteronomy 6.4 and 5 respectively. Quoted above is only the intro to the Veahavata; it continues with further instructions given to properly express the faith. This entry was posted in Atheism, Bible, Darwin, Evolution, Evolution as Religion, Faith, Four Spiritual Laws, Jesus The Messiah and tagged Bill Bright, Bill O'Reilly, Bo Jinn, David Barton, Isaac Asimov, Mike Keas, Richard Dawkins, Stephen Meyer by Duane Caldwell. Bookmark the permalink.